After a small period of reluctance creative, fashion seems to have finally resumed his duties this season. Thus, between the return on the forefront of the great houses, the riot of saturated color of Jil Sander & Co., the multiple nods to the optimism seventies, joy country of D & G girls or innovative proposals of Ghesquière, collections released energy both joyful, contagious and exciting. Initiated by Phoebe Philo at Celine in his debut, the neo-minimalism does not seem ready to bow out, the creators have realized that the mood of women was now the blueprint. Away from the frills and close to the perfect cut, the legacy of Helmut Lang and continues to be emulated, thus giving rise to net collections, incisors, basic and unavoidable. At 3.1 Phillip Lim, modern silhouettes mix with a beautiful minimalist religion, it does not pay to much in the absolute Jansenism. While DNA is clearly changing room bathed in simplicity, however, allows himself the creator of all sophistication through games scholars cuts and subtle colors. Phillip Lim's wife benefits from a successful mix between rigor and imagination, a very pretty way of marrying minimalism summer mode. Under the direction of Phoebe Philo, Celine continues to endorse neo-looking preppy style that rendered Lang acclaim. Between borrowing menswear, basics transformed by an ingenious pair of scissors and sportswear at the ultra chic nonchalance, Philo falls right: Celine grammar - simple, gentle and without compromise - indeed able once again to appeal to his audience. 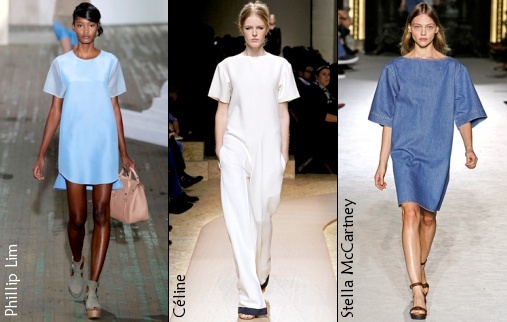 Less bold than usual, Stella McCartney for its implementation on a simple fashion starved of energy. While registering in the spirit of the times, the pace of Mormon virtually certain of its parts - like this chambray dress - they did indeed lose desirability. In other words, trying too hard to put it simply, sometimes you end up missing out on the subject. In order not to completely bland our summer outfits, they prefer minimalism Celinian So, this being one of the only - for special attention given to the cut - to generate interest while taking any form remotely of boredom. While the heart of the world economy is moving inexorably towards Asia, as luxury groups think more of the Middle Kingdom as their new Eldorado and that the West always dressed his wounds post-crisis, latest fashion sent - with varying degrees of subtlety - a resounding message of welcome to new customers eager to consume what the Asian population. At Paul Smith, the floral prints seem to have been borrowed from the elegant kimonos Asians of the past. However, if silk, through contrasting and graphics reminiscent indeed bound to the latter, the Combishort - is expected today - has the happy idea of the sublime by offering them a ride in the 21st century. In doing so, Paul Smith escapes the quote first degree in favor of a modern silhouette, with new influences to govern the world. For his part, Marc Jacobs is not interested in falling into caricature, and even seems to take a certain pleasure: it is indeed an uninhibited girl from China Shanghai 20 years of scrolling on the podium Louis Vuitton. If, however, with Mao collars, embroidered silks and his sexyness on edge, this enticing lady surely seduce the West, we are less sure of his popularity with Asian customers, who will surely be a cruel flashback .. .
Who better than Dries Van Noten - which has always dope to work with exotic influences - could give the china pattern perfectly sounding European power? 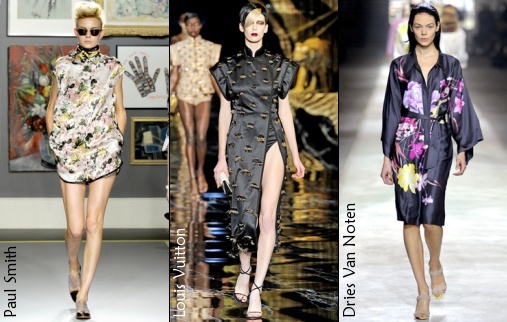 By transforming the loose kimono dress liquette painted like a Chinese print, the Belgian designer, in fact, subtly weaves a link between these different cultures, without harming any of them. Finally, we forsake the interpretations in favor of first-degree designs with finesse showing the encounter between two aesthetic. Effective and timeless from Yves Saint Laurent has focused on smoking his muses, style male/female returns regularly celebrate gender equality on the catwalk. Always bearing this quickdraw not devoid of charm androgynous ambiguity, he wants this season turns rock, subtle or literal. Under the leadership of Nicolas Ghesquiere, the punk sign their comeback in the top ten trends. Creepers studded pavement and injecting a rebellious twist to the codes of the tuxedo, girls Balenciaga have in fact all the little punk couture. With their deceptively disheveled draws, they call up to date a sophisticated androgyny, between rockabilly and technocouture remix. 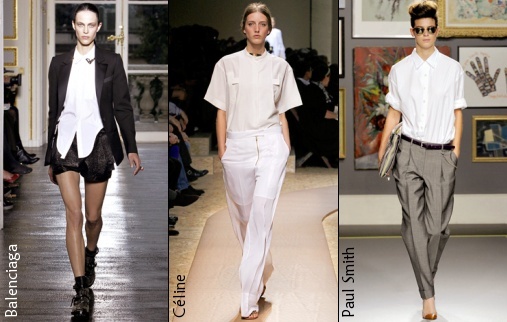 If one refers to the last parade Céline, slipping into men's clothes is the best way to win in both comfort and style. Borrowing from the male baggy pants and immaculate shirt fronts, Phoebe Philo sublime tendency unisex translucent tissue sections and design details. At Paul Smith, a woman 99% tomboy who walks on the catwalk. In addition to their heels, the models hair to code very Elvis Presley have in fact thrown to oblivion their wardrobe girly attire in favor of high-dose testosterone. And it works perfectly: white shirts with sleeves and pleated trousers roulottées rarely appeared as desirable. The boyish style has been treated brilliantly by each of these houses, fashionistas will be spoiled for choice when it comes to give a patina to their male wardrobe. Looking for the positive vibes that could emerge from the gloom of last seasons style, the fashion world has been plunged back delightedly in the heart of 70 years, finding something to replenish your endorphins psychedelic. Familiar with the genre, Anna Sui and it is given a field day, designing looks that the Woodstock festival would probably torn. Round glasses, short hook, faded denim jacket and bag up loose then the ideal mix of those who decided to give themselves body and soul to fashion an artificial paradise. Finally, only Marc Jacobs succeeds - in Woodstock sulking in favor of the style of the late seventies - to take his distance from the idyllic picture of a decade 100% joyful. 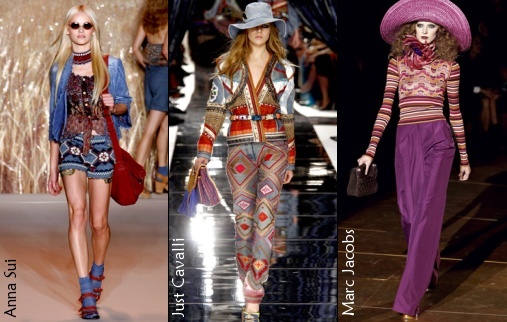 Whether his ideas by drawing in the wardrobe of the heroine of Taxi Driver or paying tribute to early Rive Gauche by Yves Saint Laurent, Marc Jacobs reinvents a cloakroom infinitely feminine, imbued with the aura of these great hours fashion that lit up the pre-1980. We are left then, to go see the film Scorsese to immerse ourselves in the hazy appearance of the young Iris.